It’s a very long time since I last read any of the poetry of Francis Thompson, though his work is probably worth another look if you are interested in fin de siecle London. He still has his admirers and I recall that there used to be a Francis Thompson Society, and that Thompson was a leading figure celebrated long after his death by The 1890s Society. 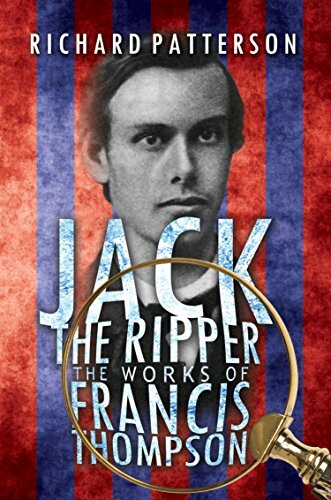 I’d almost forgotten about him until I was sent a copy of Richard Patterson’s book Jack the Ripper: The Works of Francis Thompson. A most enjoyable and intriguing read, even if it doesn’t altogether convince me that Thompson was the Whitechapel killer. However, were I a police detective at the time, looking at Mr Patterson’s evidence, I would certainly put Thompson in the frame for further investigation. Now, about twenty years ago, I spent a great deal of time researching Jack the Ripper. I remember long days (and nights) walking the streets of Whitechapel and many hours in dusty archives, including those of the British Library and Museum of London. I came to no particular conclusion as to the identity of the murderer, and I thought then – and I think now – that there will never be a definitive answer as to just who Jack was. Jack the Ripper books tend to follow the same pattern; a few chapters on the misery of the East End at the time, followed by detailed accounts of the discovery of each victim and the immediate aftermath and the police investigations. Most Ripper books then try to put a favoured suspect in the frame. Some authors go to extraordinary lengths to twist the facts to represent their chosen candidate as the Ripper. Mr Patterson’s book takes a different approach, which I welcome. He certainly writes about the East End and the victims of this maniac but he wisely assumes that the Ripper reader is already familiar with much of the background. He then spends much of the book looking at the biography of Francis Thompson himself and explaining just why he thinks Thompson could be the Ripper. At first glance the fragile Thompson, plagued by ill-health, seems an unlikely candidate. But Thompson was a medical student who enjoyed dissecting cadavers, wrote poetry about prostitutes, indulged in a spot of arson when he was young and was an opium addict. He was haunted by the hell-fire of an over-religious upbringing, lived on the streets of London during the relevant period and fell in with a prostitute who at first looked after him and then betrayed him, sending him – Mr Patterson suggests – into a murderous rage. However, even such a promising background doesn’t necessarily create a serial killer. There are a great many sad individuals who do much of the above but don’t take it to the final extreme of murder. Though, Mr Patterson doesn’t try to force his candidate down the reader’s throat (unlike one or two Ripper authors I could mention). The author wisely invites readers to make up their own minds. The evidence is, as it has to be, circumstantial. There is no killer blow (no pun intended) which definitively puts Francis Thompson in the frame for the Whitechapel murders. One problem I have with all Ripper candidate books is that we always get the case for the prosecution, but hardly much of the defence brief. And I cling to the principle that anyone accused of murder should get a fair trial. Sadly, there is no modern biographer of Francis Thompson who could look at this evidence and give an opinion. That being said, Mr Patterson is fairer than most Ripper authors to his subject, and at the end of the day every reader and Ripperologist must make up his or her own mind. This is a very enjoyable, well-written book and a fascinating contribution to the age-old debate. Recommended reading for anyone interested in late Victorian crime and society. I recommend They All Love Jack by Bruce Robinson for both his work on the Jack the Ripper events, a likely suspect and his analysis of the work done by others on this subject. Hello Bill, yes I think it’s an excellent book – I blogged it on February 9th. I thought he made out a very good case, regards John. Thanks, John, will check it out.